Starring: Rafe Spall, Robert James-Collier, Sam Troughton, Arsher Ali, Kerri McLean, Maria Erwtoler, Paul Reid. 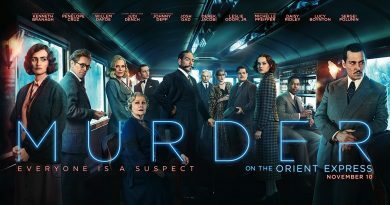 Britain is hardly renown for its horror output: we excel with our crime shows and our period dramas are usually pretty decent, but horror has never been our calling card. In fact, it doesn’t perform particularly well on our shores either (well, It did, but It performed well everywhere so it doesn’t count). We’re just not an easily scared bunch; conversely – and probably more likely – we’re a very easily scared bunch, so avoid the genre like the plague. 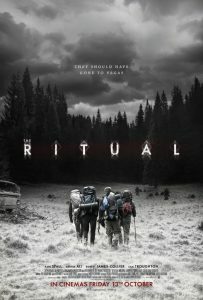 Does The Ritual provide the lost-in-the-woods thrills you’re seeking in the lead up to Halloween? And will the British production win the land of Brexit round? The Ritual is as conventional as they come. It willingly serves up every horror convention in the book, with little care for invention or creativity. 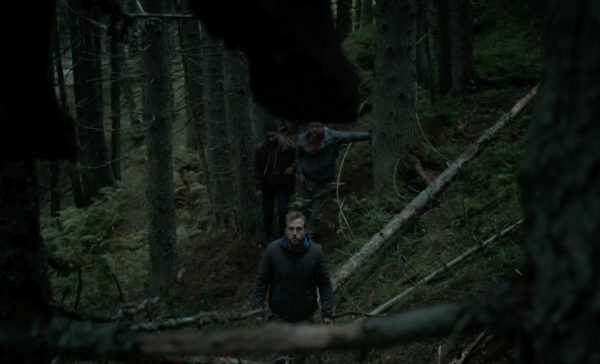 It’s Blair Witch meets The Witch, with scary Sweden providing the frights – perhaps not effectively as intended though. 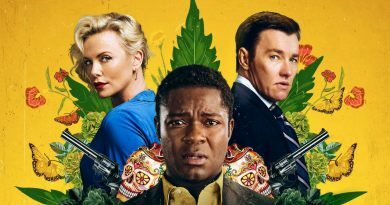 Almost shamelessly, it unfolds in a perfunctory manner: this hampers the momentum and intensity, ultimately struggling to convince me its worth your time. Joe Barton’s screenplay, adapted from Adam Nevill’s novel of the same name, provides a loose back-story that gets the group to Sweden. From there onwards though, it frequently indulges in conventions and the tropes come thick and fast; bumps in the night, scary point-of-view shots and passing shadows enforce the horror in a rigid, stilted manner. The Ritual’s atmosphere is well-conjured but an over-reliance on jump scares remind audiences that they have seen this all before. 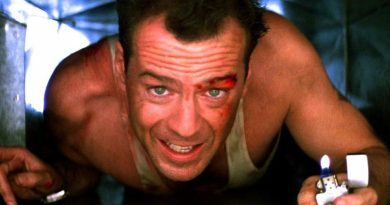 It is not inspired work but Barton operates effectively at times, with some substantial scares and set-pieces; the connective tissue is what lets it down. When the direction is good, it is really rather great; when it’s not though, it comes across rather amateur. David Bruckner has mixed success throughout but becomes more confident and self-assured as we reach the second half of the film. He infuses reality with Luke’s nightmares, crafting some intense set pieces from Luke’s self-inflicted fears. It is visually strong but loses its way narratively when the third act veers off in a questionable direction. ‘Really?’, I thought as we ventured into the final stretch. The fear is diluted considerably when the unknown becomes known, losing power and potency of the chills and thrills. It’s a trait we see in so many horror films and The Ritual cannot escape it. 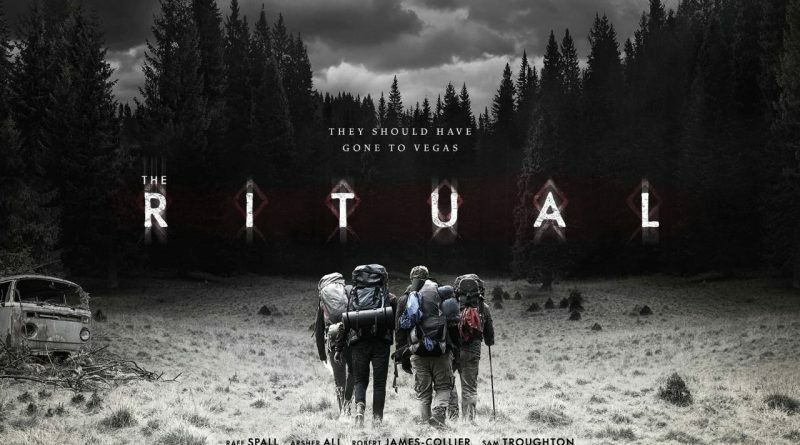 The Ritual deserves credit for is making the most out of its picturesque setting. At times sweeping and at others claustrophobic, Bruckner explores the forest in a tonally appropriate manner. Enriched by Andrew Shulkind’s cinematography (light pouring through the trees is always one of my favourite things to see on screen) and the robust production design, The Ritual’s solid art team deliver impressive visuals when the narrative loses direction. 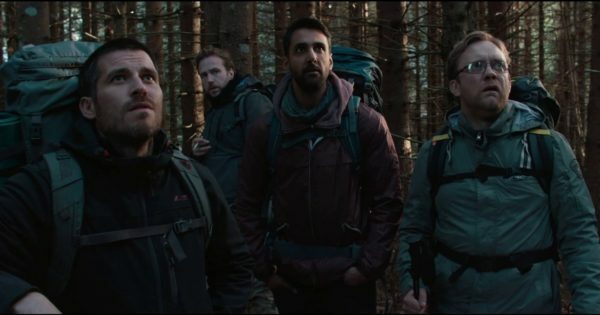 Rafe Spall, Robert James-Collier, Arsher Ali and Sam Troughton lead the film with solid (if unspectacular) efforts. An interesting group dynamic is effectively explore, despite some frustrating character actions. Spall has the meatiest role, crippled with survivors’ guilt eating away at his conscious. It is a durable performance and he sells his manifesting guilt and fear well. Robert James-Collier’s Hutch is the most poorly-defined character of the bunch but his talent ensures a solid- enough supporting turn; Arsher Ali is likeable with the most recognisable character traits; and while Sam Troughton’s Dom is increasingly irritating (eliciting a few eye-rolls), he grows into something more convincing as the fear escalates. Even with its structural issues, The Ritual is generally well-paced and avoids overstaying its welcome. Even with an unsatisfying second half, the horror is gradually intensified and it’s not without its strengths; the imagery is striking and the film begins to break away from conventions – albeit not completely. The Ritual eventually builds up the courage to take risks and while the landing is lackluster, the attempt is notable. Two roads diverged in the woods and The Ritual takes the one frequently travelled by, delivering an uninspired but serviceable lost-in-the-forest horror. Genre fans looking for a decent horror in the lead up to Halloween may have a blast; others may struggle to stay engaged on the formulaic, often generic adventure. It starts strongly but becomes trapped by conventions and formulas, damaged by a disappointing final act that provides an uninspired but passable feature-length. The Ritual is adequate viewing but a sacrament you may wish to skip until its available for rental.